Many practices are struggling to do more with less revenue, due in part to changes in the Affordable Care Act, shifts in reimbursement models, and an increase in consumerism in the health care landscape. In fact, Forbes recently reported that the average provider (across all medical specialties) is seeing top line revenue drop by over $50,000 per year since the health reform law went into effect. If you're looking at anemic revenue streams, there are steps you can take to revitalize your existing streams and explore new options to beef up your bottom line. 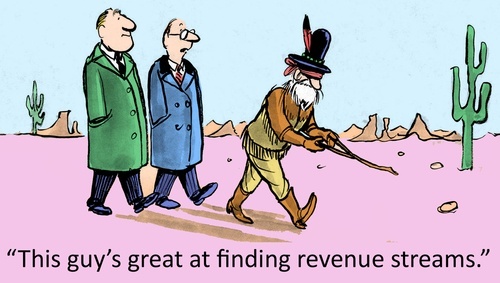 Here are 10 steps any practice can adapt and use to bring more revenue through the door. These simple tactics increase the money you bring in while decreasing what you spend managing routine tasks. Start by analyzing your patient mix and determining your ratio of capitated versus fee for service customers; try to allocate your appointments in the same proportions. For example, if 60% of your patients are in FFS plans and 40% are under capitated contracts, your schedule should approximate that. Set aside a schedule block each day for capitated patients and leave your same-day and extended-hours appointments for your more lucrative FFS customers as much as possible. FFS patients have more health care options, and you don't want to miss out on the extra revenue by turning them away, sending their dollars to other providers. Be sure to develop and communicate effective triage policies before you implement your new schedule plan and don't forget to have an automated patient communication system in place to confirm appointments and fill any last-minute cancelations in your schedule. If you haven't implemented an electronic health record, or if you're working with one that isn't customized for your work flow, it's time to modernize. Go through templates and make sure your coding and documentation is accurate and reflects the services you provide. Implement time-saving features such as ePrescribe and integrated lab and imaging, and encourage patients to use your patient portal for appointment requests, refills, and other routine communications. Now is a great time to evaluate your actual costs for keeping services in house. Do you maintain coding, billing, or transcription staff? Ask for vendor proposals to outsource these services, especially if they offer improved performance at a lower cost. Is voice recognition or template-driven documentation an option for your group? For small to medium-sized practices, outsourcing and updated technology solutions are usually more cost-effective. These are some of the more profitable revenue enhancers that don't require a major upfront investment in most cases. Depending on your practice size and specialty, integrating pharmacy services can cut administrative costs related to refill requests while adding a new revenue stream. The Association of Community Cancer Centers issued a report on in-house dispensing pharmacies in private practice and the results were very encouraging. In most cases, ROI was achieved relatively quickly, and patients and providers found the convenience and improved compliance with therapy regimens enhanced the overall quality of care. Of course, there are many considerations associated with the decision to bring dispensing services in house, including state laws, space requirements, insurance agreements, and building inventory, but in the right environment, this is a money-making value-added service for patients, a win-win for your practice. According to the American Society of Plastic Surgeons, minimally invasive cosmetic procedures such as dermal fillers, laser hair removal, chemical peels, and botulinum toxin injections are up between 4% and 9% in 2014. Since 2000, in fact, Botox-type injections have increased almost 750%, dermal fillers are up 250%, and laser skin resurfacing 218%. These are high margin services that can deliver quick ROI if implemented and marketed effectively. Depending on your practice location and demographics, investing in medi-spa services may be another way to add high-dollar revenue streams. Supplemental hormone therapy is helpful in a number of medical conditions, including menopause, andropause, and even certain types of depression. Due to its increasing use, hormone testing and balancing has grown quickly as a medical niche service. Nina Grant, VP of Practice Builders, cautions, "The doctor really has to know what they're going to do with the information [in hormone tests]. You don't want a doctor adding tests just for the sake of adding tests." According to U.S. News, Americans spend over $60 billion a year on weight loss, including gym memberships, diet counseling, and specialty food products, and they are focusing more and more on whole-body health. Whether your practice adds nutritionist services or goes all in with a supervised medical weight loss program and medical food, this is a potential money-maker for a practice with the right patient mix. Don't leave anything on the table when it comes to collecting what you're owed. Be sure you're using the latest technology in electronic claims processing and electronic payments processing. This is the easiest way to shorten the revenue cycle so your money is working for you, not the insurance carrier. Some insurance carriers are notorious for incorrect adjustments and denials, so it's important to dedicate resources to ensure you're getting what your due in your insurance contracts. If there's a recurring issue with documentation or coding, take steps to correct it. If you use a billing service, find out their policies for working pending and rejected claims and monitor their performance. Communicate your upfront payment policies with new patients and when confirming appointments with existing patients. Collect copayments and/or coinsurance when patients sign in, and offer estimates and financial counseling for fee-for-service patients. Make sure you accept credit card payments to make it easy for your patients to pay their share at the time of service. Revitalizing your revenue involves a smart combination of increasing collections, controlling costs, and adding new sources of patients and new revenue streams. These 10 tips will get you started on the path to a healthier bottom line. Find out how RevenueXL can help you lower expenses and achieve your income goals; contact us today for a consultation and free demonstration. Why Coding Audits are useful to ensure compliance?